One of the area’s Premier Courses, a Golf Digest award winner and chosen by The Washington Golf Monthly as A Best New Course for 1996. 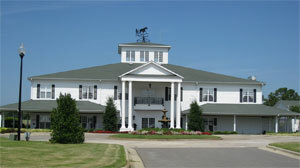 A unique landmark in the world of equestrian sports becomes a legendary world class golf course. Sculptured from 450 acres of rolling hills and featuring nearly 200-foot elevation changes, narrow rivers and thick forests. Best greens.